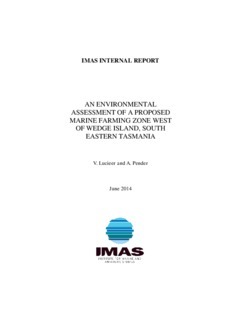 An environmental assessment of a proposed marine farming zone extension west of Wedge Island was conducted between March and June 2014. The site covered 17.22 km2 (1722 ha), demonstrated a depth strata from 37 – 55 m and was orientated in a north south direction. The benthic habitats within the zone assessment area comprised of sand – 1715.83 ha (99.59 %) and gravel- 7.00 ha (0.41%). Environmental data on substrate type, habitat distribution, bathymetry, and benthic flora and fauna were assessed. The dominant sand substrate was characterised by a dark orange brown colour and exhibited large flat regions with ripples, drift algae and shell grit. The video data highlighted the presence of rippled sand with shell grit. Three video transects captured the presence of New Zealand screwshells (Maoriculpus roseus), with one additional video transect identifying Gazameda sp. or Colpospira sp. Three video transects highlighted polychaete tubes extending above the sediment. The sediment grabs captured samples of a pebble crab (Dittosa undecimspinosa), Heart urchins (Echinocardium cordatum), bivalves (Diplodonta tasmanica) and (Glycymeris striatularis), Brittle stars (Ophiura kinbergi), Hermit crabs (Paguristes sp. ), a wavy volute shell (Amoria undulata) and a live Peanut Shell (Adamnestia arachis). All of the grab samples were odourless. The initial assessment survey captured twenty sediment grab samples across the zone. In this initial survey one sample contained a live specimen of the native screwshell, Gazameda gunii. This was positively identified by the Tasmanian Museum and Art Gallery Zoology Department and therefore, following the Marine Farm Assessment protocol, a further twenty grab samples were collected across the site. Gazameda gunii was identified in 3 of the additional 20 samples. An interesting feature within the site was the presence of localised depressions in the sediment on the eastern boundary. These depressions were found at 47 m depth and were on average only 1 m lower than the surrounding seafloor. The sediment composition differed to the surrounding sand as these pockets were comprised of gravel and coarse sand with shell grit.